THE FORTNIGHTLY REVIEW, one of the most influential English-language periodicals of the 19th century, was the invention of Anthony Trollope, who, with the support of Frederic Chapman, James Cotter Morison, Danby Seymour, Alfred Austin, and others, decided to launch a magazine designed to free the “higher journalists” of the time from “the views of an Editor or Political party.” Under the editorship of George Henry Lewes the first issue appeared on 15 May 1865. The subeditor was John Dennis. For copyright, print archive and contact information, click here. For editorial information and submission guidelines, click here. THE PRESENT ‘NEW SERIES’ seeks to disprove Trollope’s assumption that “opposites will not appear in conjunction with liberalism, free-thinking, and open inquiry” by inviting views both complementary to and divergent from those expressed in the pages of the Fortnightly and other similar periodicals and presenting them in a medium that encourages eclecticism and contrast. This New Series of The Fortnightly Review is an editorial experiment, as was the Fortnightly at its inception. In the case of this series (more precisely the third series of the periodical; a “new series” first appeared in January 1867, reflecting the change in publication frequency to a monthly), the experiment is in the use of a new medium in which editorial juxtaposition is an interesting component of the presentation of ideas, often providing a modern context for older texts – especially those not easily obtainable elsewhere – and the critical and other values they represent. (A simple example is seen here.) The intention is to provide a basis for the examination of ways in which innovations in publication shape literary art and illumine older work in the light of new – and vice-versa. The editorship was taken on jointly by Prof Anthony O’Hear, Director of the Royal Institute of Philosophy, and Denis Boyles, formerly a visiting fellow at the University of Buckingham and now on the faculty of l’Institut Catholique d’Études Supérieures in La Roche-sur-Yon, France. After a period of surprising growth, the editorial arrangement was altered. Prof O’Hear required more time for his work and so Prof Alan Macfarlane, Professor Emeritus of Anthropological Science and Life Fellow of King’s College at the University of Cambridge, assumed the co-editorship of the Fortnightly and a number of contributing editors were added. Denis Boyles supervised the launch in late 2013 of the Fortnightly’s “Odd Volumes” imprint. The Fortnightly is updated often, although what is called a “principal article” appears every week or two – sometimes three. Comments (either by one of our correspondents or from sources elsewhere), along with miscellaneous reviews and notes, appear frequently in the Fortnightly’s Chronicle & Notices department. (For an extended view of periodicity and this publishing model, see here.) Content is indexed in the right-hand column and in the extensive index on the cover page. The Trollope Prize: The Fortnightly Review provides a modest honorarium to the graduate winner of The Trollope Prize awarded by the University of Kansas. The winning essays are published here first. A thorough history of the Fortnightly Review by Janet (Hogarth) Courtney, the wife of W.L. Courtney, the Fortnightly‘s longest-serving editor and a very attentive observer of London’s literary life, has been transcribed for the editors of this New Series and appears here. Additional comment by the Courtneys on the life and career of John Morley, an early and influential editor, appears here. Further information will be found in the sources cited at the bottom of this page. The New Series’ motto, “The stroke of an oar given in true time,” is by Ruskin who used it to describe “one of the simplest pieces of perfect art” in a lecture, “Of Wisdom and Folly in Art,” given on 8 February 1872. In 1954, The Fortnightly (“Review,” the most appropriate of the two words in the original title, had been dropped earlier and the article was incorporated on a formal basis) was incorporated into The Contemporary Review. 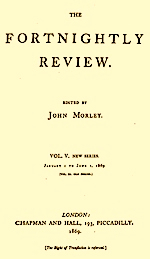 The Contemporary Review, established as a rival in 1866, was, until 2011, published by the Contemporary Review Trust and had no association with this website. Sadly, The Contemporary Review has now apparently ceased publication. This New Series of The Fortnightly Review was launched by Anthony O’Hear and Denis Boyles. In 2014, Prof Alan Macfarlane became a co-editor. For more information on the current editors and contributors, please click here. The New Series template is based on VeryPlainTxt, a theme by Scott Wallick. Research and other notes: The Rossetti Archive has a limited number of entries archived from the Fortnightly Review. The Internet Archive has a selection of digitized issues online. A nearly complete index of The Fortnightly Review through 1900 may be found in The Wellesley Index to Victorian Periodicals 1824-1900 (Vol 2) . Trollope’s obituary of Lewes, published in The Fortnightly Review on 1 January 1879 – and republished in an abridged version in The New York Times on 16 February 1879 – is available online at Ellen Moody’s website. Lively reading about Trollope and others may be found at the Anthony Trollope website. Those interested in digital research relating to the ‘long’ 19th century (1789-1914, according to historian Eric Hobsbawm) will find the contents of Patrick Leary’s Victoria Research Web and the work of NINES useful; those interested in ‘little’ magazines published between 1880-1945 will be grateful for the index at the Modernist Magazines Project (which also includes The Germ from 1850) and the joint project of Brown University and the University of Tulsa at the Modernist Journals Project. We encourage students and scholars to join and support the Research Society for Victorian Periodicals. Sources consulted for this page: Trollope: An Autobiography (Oxford World’s Classics) ; W. Houghton: The Wellesley Index to Victorian Periodicals 1824-1900 (Vol 2) ; R. Mullen: Anthony Trollope: A Victorian in His World; R. Super: The Chronicler of Barsetshire: A Life of Anthony Trollope ; Sullivan: British Literary Magazines: The Victorian and Edwardian Age, 1837-1913 (Historical Guides to the World’s Periodicals and Newspapers) ; Everett: The Party of Humanity: The Fortnightly Review and Its Contributors, 1865-1874. ; “What’s in a Name? : Signature, Criticism, and Authority in The Fortnightly Review.” Sarah Nash. Victorian Periodicals Review – Volume 43, Number 1, Spring 2010, pp. 57-82. For more on Trollope and his world, visit Amazon’s page for Richard Mullen. The Fortnightly Review’s initial prospectus, as published in the Saturday Review and in the Athenaeum, 25 March 1865, appears here. Source: Everett.